Clock widgets, clock livewallpapers - when will we have enough of them? Never, I say! 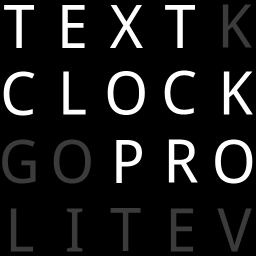 Every once in a while, a new clock variant comes out that pushes the limits of originality, and I think this is what we have here today with Text Clock Pro. If you've been in an English fanatic's kitchen, there's a chance you might've seen a bunch of word magnets on their fridge which you can assemble into sentences.